Attack coach Alex King has highlighted fly-half Mike Delany as a real threat to Saints in today’s game at stadium:mk (kick-off 1.45pm). Delany joined Newcastle Falcons from King’s former club Clermont Auvergne during the summer and will start at 10 against Saints. The 33-year-old was previously a symbol of the depth of Clermont’s squad as he often struggled to get into the Top 14 team’s starting 15. But now he is in the driving seat for Newcastle, and King knows he will be part of a Falcons backline capable of causing Saints problems. “I know Dave Walder, their attack coach well, from our time at Wasps together,” King said. “He’s been away to Japan to learn his craft away from the Premiership and he’s come back and changed the way Newcastle play. “Their new 4G pitch (at Kingston Park) has helped the way they play and I know their No.10, Mike Delany, well from my time at Clermont. “He’s an All Blacks stand-off who gives them real direction from No.10. 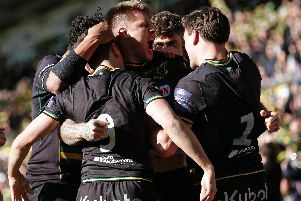 But Saints, who lost 13-12 in last weekend’s Aviva Premiership curtain raiser at Worcester Warriors, certainly won’t be lacking determination at stadium:mk on Saturday. “We weren’t good enough last weekend and we want to put things right this weekend,” said King.